Why Prune Ambrosia Trees in the Dead of Winter? You might be inclined to think that Ambrosia apple growers kick up their feet and relax all winter long while the trees slumber. Think again. Winter is an important time in the orchard and farmers are out there every day getting the trees ready for the growing season to come. Pruning is the practice of trimming offshoots and branches from the tree. The best time to do this is while the trees are resting during the cold, winter months. There are a few reasons for this. First, the orchardist can see what the tree’s structure looks like and easily trim away branches and new buds without leaves getting in the way. Plus, doing it in the winter when the tree is dormant is less stressful for the tree. The tree isn’t in the process of trying to grow apples the way it will be in a few months, it’s just resting. If orchardists didn’t prune and just let the trees grow unchecked, there would be big trouble. The tree would be working so hard to turn all of those buds into blossoms (and then apples), that it wouldn’t have enough energy to grow good apples. You’d end up with a lot of apples but they’d all be really small. By thinning out the branches and nipping some buds, the tree will know exactly where to send its energy. This will help produce those big and juicy Ambrosia apples. So, if farmers want to grow good size apples and have a healthy orchard, they have to put their winter boots on, bundle up and head out into the snow to prune the orchard. Want to know a secret? Some farmers really love this time of year. It’s quiet, they have lots of time to think, and they get a chance to get reacquainted with every tree in the orchard and give it some loving attention. 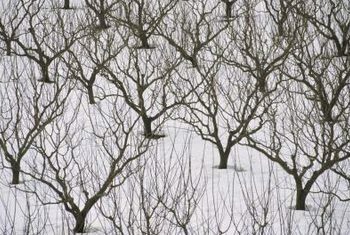 If you’d like to get a better sense of what it’s like to prune an orchard in the middle of winter, check out this video.